Not far from Suncadia is the beautiful Alpine Lakes region. The name Alpine Lakes takes its origin from the nearly 700 small mountain lakes nestled like jewels among the high rock peaks and timbered valleys of the region. It encompasses approximately 394,000 acres accessed by 47 trailheads and 615 miles of trail. Its breathtaking beauty makes the Alpine Lakes one of the most popular natural areas in the United States. 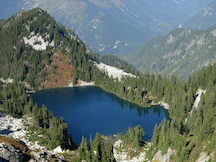 All visitors to the Alpine Lakes Wilderness from May 15 to October 31 need a permit. Day-use visitors may obtain a free, self-issue permit at ranger stations and trailheads. A copy of the permit is carried with you and a portion is deposited in the box at the trailhead. Among the most accessible and breathtaking hikes is Cooper Lake – an ideal spot for a summer picnic or a late afternoon paddle.